The Ford Mustang is a special vehicle. It is the quintessential pony car, one of the last true American muscle cars, and you can get one of your very own. Don’t pay full price for a new one when a high-quality used one will drive just as great, have many of the same features, and cost you far less. You can get a used Ford Mustang in Chicago, IL at Apex Motorworks. Drive the pony car that you’ve always wanted and be ready for the smile to stretch across your face. 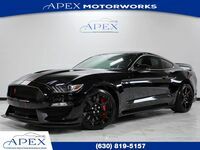 At Apex Motorworks, we almost always have Ford Mustang options in stock, and you can find our current Ford Mustang inventory at the link below. We can always help you locate the car of your dreams. Keep reading to learn more about us and the Mustangs we sell below. For those unfamiliar with the Ford Mustang, let’s give you a brief description. A Mustang puts the engine up front, the drive wheels in back, two doors on the side, seating for five on the inside, and real power under the hood. The Mustang is also available as either a soft top convertible or with a fixed hardtop. Traditionally, the Mustang is a V8 machine, but it can also be had with a V6. More recent models also include a turbocharged four-cylinder option. The Mustang has several performance versions available, starting with the GT, continuing with the Shelby GT350, and topping out with the Shelby GT500. At Apex Motorworks, it’s those performance models that we routinely have in stock, along with a few rarities from the past. The Mustang has been in production non-stop for over 50 years, and we love representing that heritage when we can. Order a pre-owned Mustang today! When it comes to your dream Mustang, you may have very specific tastes, and we certainly understand that. Whether you want the ideal color or engine or if you are just set on getting a coupe or convertible, the Apex Motorworks team can still help. If you don’t see the model that’s right for you in our inventory, feel free to reach out to us. You can tell us exactly what used Mustang you want, and we will get to work finding it. Get started with the link below.